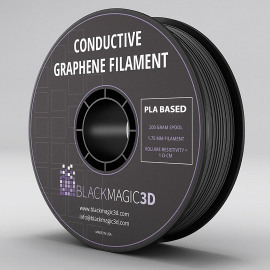 A 200g spool of conductive graphene filament from Graphene 3D Lab, Inc. Additive manufacturing describes a number of techniques which include but go beyond 3D printing. And even within fused deposition manufacturing there are multiple technologies beyond the common fused deposition systems that can be enhanced by nanomaterials. As well as the increase in use of 3D printing in prototyping, we are seeing an increase in the use of the technologies to produce not just custom parts but larger volume assemblies such as air vents (Airbus) and fuel injectors (GE). There is considerable interest in the use of this technology with a wide range of materials – see University of Texas El Paso, the National Additive Manufacturing Innovation Institute, the Digital Manufacturing and Design Innovation Institute and the just formed Buffalo Manufacturing Works. Conventional stencil or screen printing is used to deposit a range of nano enhanced materials including solder pastes and silver pastes for die attach and solar cells. It can even be argued that these are used for 3D printing as there are print-on-print technologies used to produce elevated rather than flat conductors to minimize solar cell shading. Nanomaterials are generally used here to develop melting temperatures lower than conventionally-sized metal powders. Reducible oxides can also be printed to produce additive circuits e.g Novacentrix’s CuO ink process combined with photonic curing / reduction. Non-metallic nano and near nano-sized fillers based on silica and carbon have been used in molding compound and dispensed underfill in order to modify flow characteristics. Let’s look at particular at the newer 3D printing processes. A common user complaint is about the high cost of raw material licenses and proprietary products but as the market is starting to open up, more and more companies are entering the arena with products that improve the properties of the final product. Fused deposition is the 3D additive manufacturing technology most commonly seen. A “glue gun” meets polymer filament and precisely deposits it on a substrate, layer by layer. The most common polymers used are PLA (polylactic acid) and ABS (acrylonitrile butadiene styrene) but a range of engineering polymers are now becoming available. Filler systems for resins could impart a range of optical, physical, rheological and electrical properties – for example using graphene to impart conductivity. Jetting process include binder jetting where jetted liquid bonds a renewable powder layer, and polymer jetting where UV curable polymers are jetted and then rapidly cured. In each case, filler properties of nanomaterials can be used to modify the properties of the final product. Liquid curing systems like stereo-lithography and digital light processing polymerize acrylic or similar resins that could potentially contain sub wavelength nanomaterials without affecting curing. Direct laser sintering of a powder bed can be used for both polymers and metals; in the case of metals the lower melting point of nano-sized particles could aid rapid sintering. For a useful brief overview of these digital manufacturing technologies see “Digital Manufacturing for Dummies”. So, as is often the case, nanomaterials tend to be enablers of enhanced properties rather than developing new types of structures by self-assembly or other advanced techniques. But watch this space as we move rapidly through what has been called Manufacturing 3.0 (digital manufacturing) to Manufacturing 4.0 (IIoT, Industrial Internet of Things) as new developments are appearing daily.